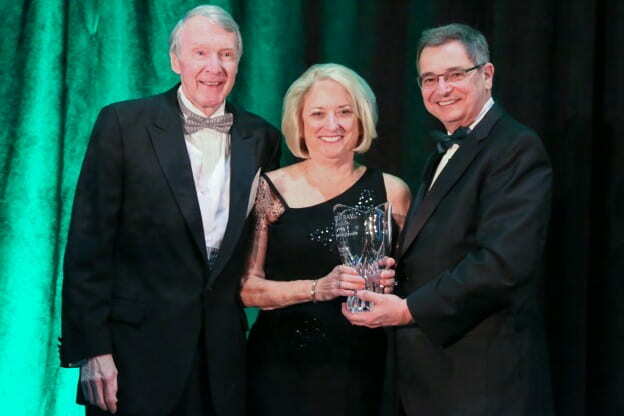 The University of Wisconsin-Green Bay Foundation honored Jack and Virginia (Ginny) Riopelle with the first Green Bay Society Award on November 17. The award was presented at an event hosted by the UW-Green Bay Foundation to show appreciation to donors of the 360° Challenge Campaign, which raised $12.7 million for the University, and to launch “The Green Bay Society,” a new University-wide program for donors who make major gifts and leadership annual gifts in support of UW-Green Bay. The Green Bay Society Award honors individuals who have contributed exceptional philanthropic support and/or have helped greatly in fundraising and securing community support for the advancement of UW-Green Bay. Ginny Riopelle is a longtime member of the UW-Green Bay Council of Trustees and co-founder of the University’s award-winning Phuture Phoenix program. Ginny has been one of the University’s most successful volunteer fundraisers. A previous campaign she chaired, which concluded in 2009, dramatically increased the University’s endowment. Jack Riopelle has been a long-time business executive and has helped make connections for UWGB with area business leaders. Together, they support a number of scholarships and endowments at UW-Green Bay.